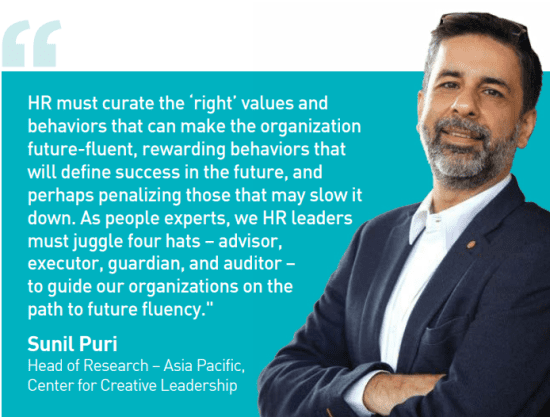 This special feature digs deep into the research study “Architecting Future-Fluent Culture: Critical Role of Human Resources” – Asia Study 2018 conducted jointly by the Center for Creative Leadership (CCL) and Singapore Human Resources Institute (SHRI) that aims to understand the roles that the HR function must play in order to shape a future-fluent organization culture. Rapidly evolving business models, technology changes, ease of capital flow, geopolitical pressures, and increasing and different aspirations of new and traditional stakeholders are shaping the landscape of the business environment. As Asian (and global) organizations continue to grapple with the pace of disruption, while managing their day-to-day operations, they will have to learn how to juggle two sets of priorities with seemingly different skill-sets and mindsets. Such a shift may need organizations to almost rewire their cultural and operational DNA. Leaders at the helm must also build new capacities and capabilities, and change mindsets around how they ‘think’ and ‘do’ things. HR has always played a critical role in shaping enterprise culture. There is, however, considerable room to drive more impactful outcomes. While HR has been tasked with leading “anything to do with people,” its role has traditionally been more execution-oriented, rather than strategic. The same applies to the cultural transformation journey in enterprises. HR is “called” into the journey often when the internal dialogue is already past the culture-architecting phase which means missed opportunities for HR to play a more impactful role. But how important is having the “right” culture for future readiness of an enterprise? What is business leadership’s and HR’s role in shaping the right organization culture? What are some of the challenges in shaping a future-fluent culture? What responsibilities must HR own in order to play an effective role in shaping the organization culture? What are the best practices (successes) or failure stories in this regard? The research conversations in the report center around the role of HR and business leaders in architecting future-fluent culture, critical challenges, and tactics that work and also reveal the capabilities and behaviors HR teams must exhibit to bring about cultural transformation in large enterprises. Future fluency is when leaders are prepared for the future, are able and willing to embrace continuous innovation, seek out fresh perspectives, harness the power of data and analytics, and prosper through constant change. Owing to the amount of change Asia is likely to witness over the next two decades, Asian leaders need to cultivate the ability to be future-fluent not only to leverage numerous opportunities that the region may present, but also to navigate incremental constraints that businesses and societies may face in the future. Since future fluency is about mindsets, capabilities, and behaviors, having a future-fluent culture is a must-have for creating a mindset and capability set around continuous learning, digitalization, agility, resilience, innovation, collaboration, etc. Organization culture defines values and behaviors in an organization. As mindset and capabilities are almost always a function of the dominant culture in the organization, there is a direct link between the right culture and the level of future fluency in the organization. Leaders should be able to anticipate, embrace, and accept that today’s skills will be obsolete and that they must continuously search for the best way of doing things in the future. 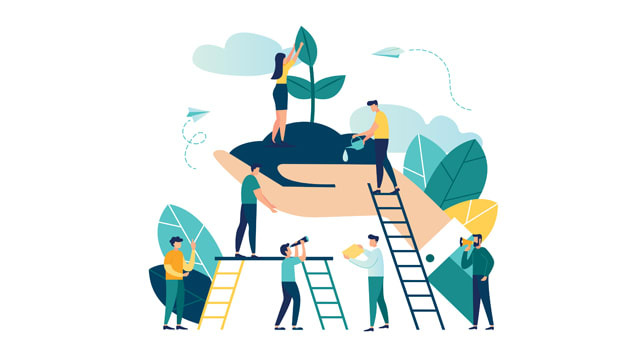 An organization’s culture directly impacts the efforts the leadership team may undertake towards creating a future-fluent enterprise and therefore directly intersects with the aspiration of the leadership team to create future-fluent capabilities and mindsets. up with the competition, or the burning need for customer centricity. A right culture is a necessary building block to make an organization future ready and is one of the three main pillars of any transformation. These three pillars are culture, talent and strategy. Most failed transformation attempts are not attributed to poor strategy, but to not having the right culture and talent to execute the strategy. But what is the right time to take up a cultural transformation exercise? Any cultural transformation has to be triggered by business strategy. The HR function needs to be a critical influencer in the cultural transformation journey. It also needs to play the execution or driver role to implement cultural changes. As the frontline function for any people-related agenda, responsibility for creating the right behaviors and values squarely sits with HR, once the leadership team defines the desired culture, and plans alignment of key practices to shape that desired culture, HR needs to come into the picture and lead the culture curation journey. HR is a subject matter expert in this case; it has the knowledge and skills it can use to advise the senior leadership team as they define the culture. HR must also proactively manage culture in the enterprise as it has the best sense of the pulse of employee perceptions about the company culture, about leadership quality, and the fairness quotient in the organization. In most organizations with even moderately mature people practices, HR has access to longitudinal data about employee engagement, confidence and trust, etc. In addition, HR has the expertise to assess how well leaders model desired values and behaviors in the enterprise. Finally, HR has several very critical levers that it can selectively deploy to drive attributes, mindsets, skills, and capabilities required to drive a future-fluent culture. These include compensation, recruitment, competency frameworks, performance management tools, training and coaching, and organizational design. The experience, skills, and maturity of the HR leader, however, play a key role in deciding what levers to use, sequencing of the lever deployment, and how hard to “press” the lever to get the desired result. For instance, if the organization is looking to create a high-performance culture, it may need to deploy the compensation lever more than the others. Or, if the organization is trying to improve flexibility and/or collaboration, it may decide to use the performance management and organization design levers more than the others. For any cultural transformation to happen, HR needs to play key roles, deliver on certain responsibilities, and build critical capabilities. HR must continuously play four critical roles, one feeding into the other – advisor to business as a subject matter expert, facilitator of key changes in the organization, guardian of values, and auditor, to measure impact of HR initiatives and provide feedback to the senior leadership team. Advisor: Play a trusted partner and subject-matter expert to the leadership team and help craft the cultural transformation journey. The advisor role requires HR to be a thought leader to the executive leadership team and a subject matter expert on anything to do with the people element in the organization. Key responsibilities include making the leadership team accountable for cultural transformation, challenging conventional thinking, and helping craft the transformation journey. Must-have HR capabilities include courage, credibility, influencing, and strategic mindset. Facilitator: Institutionalize cultural changes via effective communication, modifying talent management processes and organization design, and equipping stakeholders with appropriate tools. A facilitator role requires HR to roll up their sleeves and execute cultural transformation. Key responsibilities include converting values to behaviors, creating a communication plan, using the right HR levers and embedding the new culture in HR sub-systems, equipping managers with appropriate tools, and role-modeling new behaviors. Must-have capabilities include planning and execution, collaboration, engaging with stakeholders, and managing change. Guardian: Ensure consistency of values and demonstrated behaviors in the organization, reporting dissonance if any, and supporting leaders to align to the new culture. In a guardian role, HR needs to be fiercely protective of the cultural values – identifying value-behavior mismatch, report dissonance, and acting “tough” if required. Must-have capabilities include managing conflict, having sound judgment, confronting problem employees, and delivering feedback. Auditor: Identify appropriate metrics, measure impact of culture change initiatives, and report back to the leadership team to course-correct. The auditor role needs HR to create and own the processes associated with measurement of cultural changes and behaviors. To do a good job, HR must identify suitable metrics, ensure measurement rigor, and report back to the leadership team and course correct. Must-have capabilities include analytical skills, results orientation, and courage to report data and deliver honest feedback. However, to play the four critical roles – advisor, facilitator, guardian, and auditor – HR must proactively build competencies and capabilities like credibility, trust, courage, project management, analytics, strategic thinking, and collaboration. Owing to the uncertainty that engulfs businesses due to hyper-competitiveness, technology shifts, unstable geo-politics, volatile financial markets, changing business models, and an evolving regulatory framework, only a small cross-section of leaders are confident about their organization’s future-readiness. The number one reason for lack of future-readiness is absence of the “right” organization culture with must-have values to be future-ready. Leaders are unanimous in their view that “right” organization culture can help provide a compelling competitive advantage to organizations. While cultural transformation is a joint responsibility of the leadership team, HR often emerges as the flag bearer of the exercise. HR functions in pursuit of building a future-fluent organization culture must start the journey by reflecting upon the existing culture, HR’s credibility in the system, elements of existing culture to retain and elements to change, etc. This will help the function form a baseline. HR then must prepare to play four critical roles – advisor to business as a subject matter expert, facilitator of key changes in the organization, guardian of values, and auditor, to measure impact of HR initiatives and feedback to the senior leadership team. But to play these roles in a compelling manner, HR will need to evaluate their readiness on some critical capabilities. These include courage, influence, collaboration, managing conflict, analytical thinking, etc. If these are development areas for the team leading the cultural transformation journey, then the CHRO must lead the initiative in uplifting these capabilities for her team. Finally, the function must also role-model the ‘right’ behaviors and values. The HR function is often under the spotlight during any cultural transformation initiative. Therefore, to drive any changes, HR leaders must walk the talk. The leadership team must collaborate intimately for any cultural transformation journey to be a success. Mutual respect, living the values, driving changes in their teams, and holding each other accountable are must-dos for the success of the initiative. Finally, culture is a connecting tissue in the enterprise, the leadership team, therefore, needs to continuously nurture and develop the connecting tissue to strengthen the organization, make it more resilient, and ready for the future.